I've been following Rebecca's lovely blog, Edward and Lilly, for quite some time so when she asked whether I would like to participate in her new segment of interviews called 3 Quick Questions, I was thrilled. Thanks Rebecca for such a lovely feature. 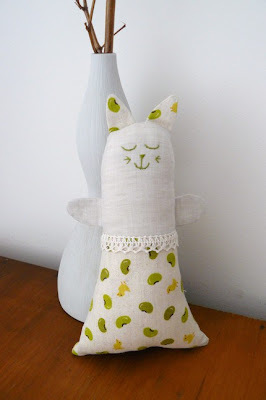 You can see the feature and read my interview here at 3 Quick Questions: Pesky Cat Designs. You also have to check out Rebecca's shop, Edward and Lilly, for the sweetest brooches, cutest softies and many other beautifully crafted handmade items. I guess a lot of us owe our love for sewing to our moms, mine would also make all our fashing (a sort of halloween) costumes, knitted jumpers, hats and scarfs and sewed unique dresses, coats and more. And all this while working full time. Two Features in One Day!